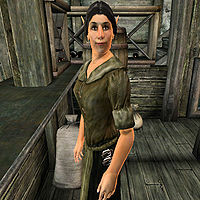 Nilawen is a Bosmer trader and the proprietor of The Fair Deal in Bravil. She sells general goods and all the upgrades for your house in Bravil at a base price of 650 gold. The unique Robe of Creativity can be purchased at her store and nowhere else. She has more than one thing in common with her next-door neighbor, Gilgondorin, in that she inherited a business after a dead relative and is forced to keep it going, despite having mixed feelings about Bravil. As a result, Nilawen lives the hard life of a typical merchant, with much hard work and very little spare time. While her tenant, the mysterious Skooma-dealer Nordinor, sleeps the entire day away, Nilawen sleeps on the third floor above the main trading room every night between midnight and 6am. After waking up, she wanders around the store until 8am, when she unlocks the doors for potential customers. After twelve long hours behind the counter, she closes up shop at 8pm. She spends another two hours on the ground floor, before she finally sits down for a late dinner before her bedtime at midnight. She wears a set of typical lower-class clothing, a collared shirt with breeches and buckled shoes. She carries around her shop key and a small amount of gold. When you meet her for the first time, she will get right down to business: "You'll always get a fair deal here. I'm Nilawen. What can I get you?" If you ask her about her city of choice, she will give you some background information: "What's a pretty young thing like me doing in this swamp town? I inherited the business from my late husband, and I aim to make it work." Count Regulus Terentius will direct you toward Nilawen after you purchase a house in Bravil: "Oh, and the place is fairly bare. If I were you, I'd head on over to Nilawen at The Fair Deal and get some furnishings."